Too many people think that the Wizard of Oz story is essentially the remarkable film version. It’s a great movie (one of the few that I do still watch repeatedly), but of course there’s much more to the book upon which the move was based. This delightful little book, Toto’s Tale and True Chronicle of Oz, by Sylvia Patience, recounts the familiar story (as told in L. Frank Baum’s book) but from the viewpoint of the only other character who has been through everything that Dorothy Gale goes through … her dog, Toto. Author Sylvia Patience takes an interesting track by anthropomorphising Toto – and why not…we already have a human-like scarecrow and tin woodman and an anthropomorphic lion, so why not? But his human-like attitude ends there… Toto, unlike the lion, cannot speak and it is this desire (to speak) that motivates him to get to Oz to meet the wizard. But of course, by not being able to speak, he can’t communicate his desire to anyone else. Only one person manages to understand his desire, but I won’t say who that is. But at the same time, that’s kind of the problem. This is the same story that Baum told. Same goal (get to Oz to have wishes granted), same obstacles. Only the viewpoint is different. And I can’t help but wonder – what’s the point? We already have this story! Yes, there are a few additions, some downright clever, but it’s still primarily the same story. And since Baum wrote a series of Oz books, I wonder why Patience didn’t write a continued journey – a new story. With Toto returning and having his own adventure, perhaps. If I were to read a story of Oz to my children (and I have), I would start with the original, then move on to Baum’s additional stories. Reading someone else’s version of the original story would be very far down on my list (unless it were significantly better than the original). Looking for a good book? 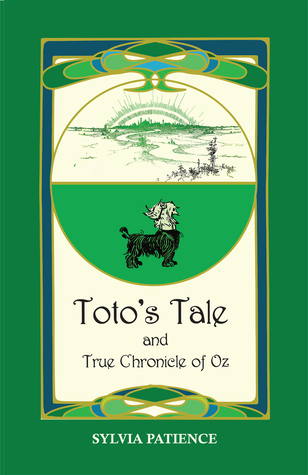 Toto’s Tale and True Chronicle of Oz, by Sylvia Patience, is a fun re-telling of the Wizard of Oz story with a little bit of a twist, but it is, essentially, the same story as L. Frank Baum’s classic, The Wonderful Wizard of Oz.